The searing, continued relevance of diaries from a Genocide. Young people caught in the crossfire of history provide fearless accounts of the horrors of war—and shatter our complacency in real time. 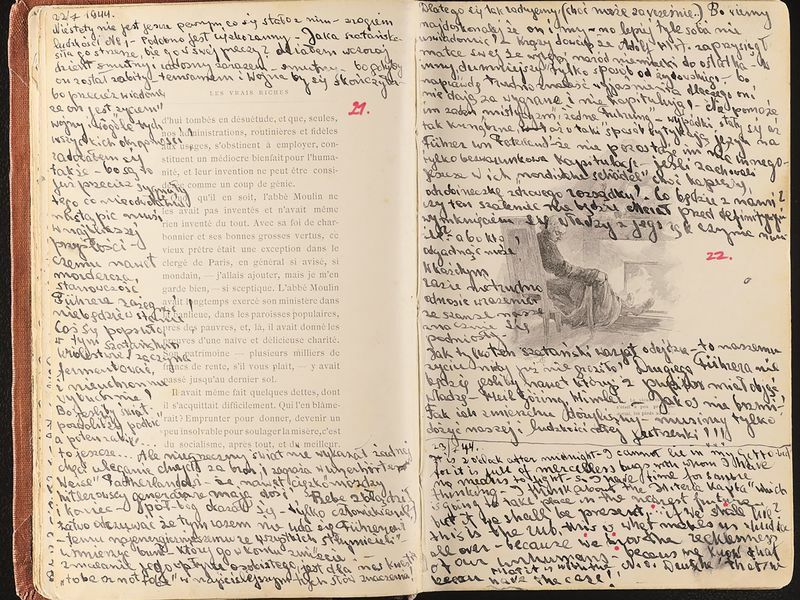 In 1944 an anonymous boy detailed the last days of the Lodz Ghetto, writing in Polish, Yiddish, Hebrew and English in the margins and the endpapers of a French novel. (Yad Vashem/World Holocaust Remembrance Center). BY ALEXANDRA ZAPRUDER, Smithsonian Magazine, November 2018. Click for full report. The writer of these lines was far from alone in dreaming that he might one day testify to the brutality he endured at the hands of the Nazis. More than 65 diaries written by young people during the Holocaust have surfaced from Germany, Austria, France, Holland, Belgium, Poland, Lithuania, Hungary, Romania and the Czech lands. Although their reasons for writing varied, many diarists—like the anonymous writer from Lodz—viewed their words as a denunciation, a way to hold the Germans and their collaborators accountable for the unparalleled crimes they committed. These surviving fragments—created by only a tiny fraction of the millions of Jews murdered—are valuable beyond measure, endlessly surprising and complex accounts written inside the cataclysm itself. What does it mean to read them? What do they tell us and why do they matter? First and foremost, nothing collapses the distance between the reader and the historical past quite like a diary. Written in the moment, as events unfold, it captures the details of daily life that inevitably get lost in later accounts by historians and even survivors. What did people eat and how much? Did they bicker with siblings and parents? How did they respond to outside news of the war? What did the ghetto street look like at night? What was the mood of the ghetto from one day to the next? What were the daily hardships and the occasional reprieves? These insights are rarely found in any other source. In addition, some writers had literary ambitions beyond just documenting their days: They challenged, raged, lamented, grieved, reproached, hoped and despaired, grappling with the biggest questions of what it means to be human in a cruel world. While adults’ diaries have contributed enormously to our understanding of life during the Holocaust, young diarists offer us something very different but equally valuable. Adolescents are in transition, establishing identity, exploring relationships, discovering what they have inherited and what they will embrace or reject. Teen diarists during the Holocaust faced that developmental challenge against an impossible backdrop, one in which their identities were reduced to their Jewishness, which in turn determined their fate. Young writers in particular struggle with the injustice of this, and with many other things besides: the vulnerability of youth and the loss of parents, the absence of schooling and normal life, the theft of time—the brutal interruption of all that is considered the birthright of the young. For 25 years, I’ve studied the diaries of Jewish teens in the Holocaust. Recently, as guest curator for an upcoming exhibition at Holocaust Museum Houston, titled “And Still I Write: Young Diarists on War and Genocide,” I’ve read a wider range of young people’s diaries in search of common themes. After the Holocaust, there were solemn promises that the world would “never again” stand by while innocent civilians were murdered en masse. But in the years since, there have been wars and genocides in Cambodia, Bosnia, Rwanda, Darfur, Iraq and Syria, among other places. Diaries written by young people have survived some of these conflicts, too. These writers report on the events of war; they reflect on the way massive forces shape their personal lives; they ask why they must suffer and struggle to survive; and they affirm their humanity while they protest the injustice all around them. A number of diaries pose fresh challenges for American readers, maybe even cause discomfort and shame. During the Holocaust, Jewish teen diarists often viewed the Allied forces, including the American Army, as their liberators, the source of their deliverance and hopefully their survival. It’s easy to see ourselves as the heroes of those stories. But not every writer saw events from that vantage point. At the height of U.S. involvement in World War II, young Japanese-Americans were writing diaries from inside government-run internment camps. A teenager named Stanley Hayami was imprisoned at Heart Mountain Camp in Wyoming when he voiced his frustration and despair at the impossible bind he faced. “I don’t see why innocent and good guys have to pay for stuff that the Japanese do,” he wrote in his diary. “Darn it anyhow us loyal Jap. [sic] Americans have no chance. When we’re outside, people look at us suspiciously and think we’re spies. Now that we’re in camp, the Japs look at us and say we’re bad because we still love America. And now the people outside want to take our citizenship away from us as if we’re the bad ones.” Hayami endured the humiliation and deprivation of internment for more than two years before he entered the Army in 1944, sent off to fight for the very country that had unjustly imprisoned him. On May 9, 1945—one day after V-E Day—Hayami’s family learned that he had been killed in action in Italy while aiding two wounded soldiers. He was 19 years old. Hayami was posthumously awarded the Bronze Star and Purple Heart. Click for the remainder of the report. Next Article Wherever you are, our Survivors and Liberators can address your school, congregation or civic group.